Roll-n-Roaster gift coins are perfect for every occasion. 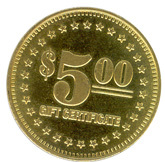 Our gift coins are sold in five dollar denominations. They can be used at anytime and never expire.